The Council is writing to ask for your views on a number of changes along Bayham Street and Greenland Street. The changes are proposed to allow bus routes 31, N31 and N28 to travel along Greenland Street instead of Pratt Street. These buses will still be stopping at the bus stop outside 167 Camden High Street (by Carphone Warehouse). The decision to change the bus route was approved in December 2015 by Camden’s Cabinet Member for Regeneration, Transport and Planning. The reason for this is to allow cyclists to safely cross Camden High Street from Delancey Street into Pratt Street by using a new cycle lane. The cycle lane is part of the improvements to walking and cycling along Pratt Street and Delancey Street which we consulted in 2015. We have agreed with Transport for London (TfL) that in order to allow the buses to safely use the new route, we feel that changes are needed to be made to Bayham Street and Greenland Street. 1. 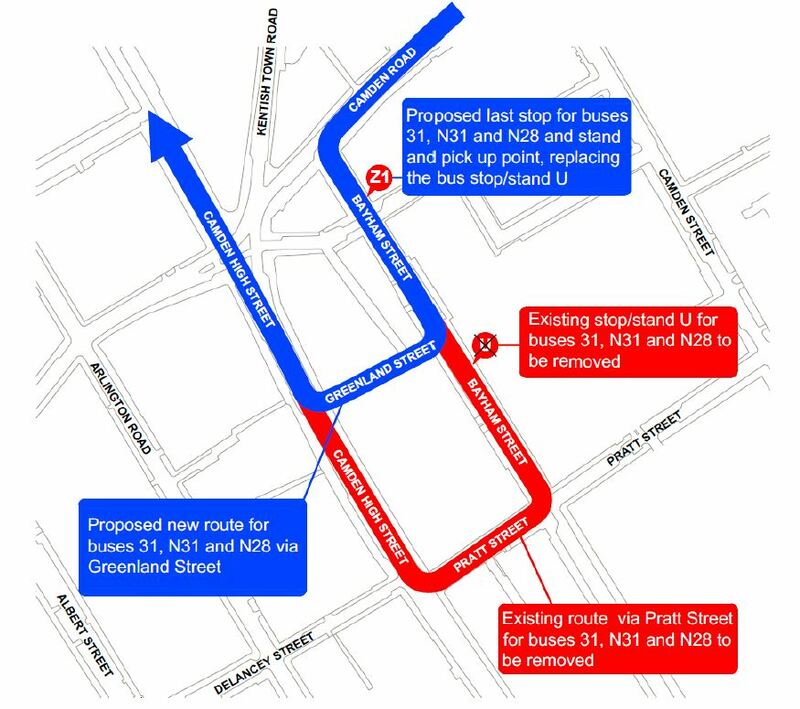 Remove bus stop/stand U and make buses 31, N31 and N28 use Bus stop Z1 (outside no.148 Bayham Street). This bus stop will now be used as a last stop/ stand for buses and the first pick up point. Bus stop/stand U will no longer be required as buses will be turning into Greenland Street. 2. Provide new island on the outside of Bus stop Z1. This will make it easier for vehicles to come out of Greenland Road (next to bus stop) and turn left into Bayham Street as they will be able to see vehicles approaching from their right. 3. Move bus stop T slightly back and widen the footway next to the bus stop, to allow better visibility for pedestrians waiting at the signalised crossing in front of this bus stop. 4. Remove the two vehicle crossovers (driveways) located outside no.116 to 134 Bayham Street which are no longer used and reinstate as footway. 5. At the signalised crossing, remove widened footway and instead widen on the opposite side. This will help buses turn right from Bayham Street into Greenland Street. 6. Move the paid for parking bays forward to make space for an electric vehicle charging bay which is being moved from Greenland Street. 7. Extend the paid for parking bays outside no.95 to 111 Bayham Street by 1 parking space, this is to accommodate the loss of one space on Greenland Street. 8. Remove the footway widening and electric vehicle charging bay and replace with double yellow lines with no loading/waiting at anytime restriction. This is to keep the area free of parking and widen the road to allow buses to make the right turn into Greenland Street. The electric charging bay is to be moved to Bayham Street. 9. Move 1 parking space from the paid for parking bays located outside no.1 Greenland Street to Bayham Street. This will allow us to keep the road free of parking near the junction with Camden High Street where the road is narrower making it easier for buses to pass through. 10. Move the taxi bays and single yellow line 4m back from junction with Camden High Street. This is to allow buses to pass through safely as the road is narrower at this point. 11. Install traffic signals at the junction with Camden High Street with a crossing facility for pedestrians to cross Greenland Street. This may result in some traffic queuing on Greenland Street during busy times of the day. However this will help pedestrians cross this busy road and allow buses to turn out of the junction safely. The council would be pleased to hear your views, alternative suggestions or objections as this consultation is intended to find out if there is broad public support for the proposals set out in this leaflet. The funding for these has been secured from TfL from their cycling programme. Please respond to the consultation by completing the Online Survey below by MONDAY 23 OCTOBER 2017. Post: send your response using the following free post address (no stamp required) to the London Borough of Camden, Supporting Communities Directorate, Transport Strategy Service, FREEPOST RLZH-UEYC-ACZZ, London, WC1H 8EQ. While it will not be possible to reply to you individually, all comments will be taken into account. The Cabinet Member for Regeneration, Transport and Planning will make a decision in November 2017 on whether or not to proceed with the changes and you will be informed via the council’s website of the outcome of this consultation within three months, where possible. Under the Local Government (Access to Information) Act 1985, your response is available for public inspection; however your personal details will remain confidential. Please only write to us about the consultation issue. If you want to comment on any other matter, please use a separate letter.